The U.S. smoking rate decline appears to be in full swing. From the industry’s “pack-a-day” peak of the 1960s, an era when about 56 percent of smokers lit up more than 20 cigarettes daily, to last year when only 14 percent of adults in the U.S. reported being a smoker. That is a two percent decline from 2016, according to The Associated Press. Another prime marketing target, teens, have also shown a steady decline. New data released recently showed 30 million adults still smoked, but just nine percent of high school students took drags from a cigarette. It’s a new low, AP reported. The study’s results were compiled after the Centers for Disease Control and Prevention interviewed approximately 27,000 adults in 2017. When factoring in cigarette sales and monitoring other facets of the industry, K. Michael Cummings, an associate of Medical Univerity of South Carolina’s tobacco research program, said the nation’s downward trend continues. “Everything is pointed in the right direction,” Cummings said. Compared to the 1960s, the new figures are a radical departure, when about 42 percent of adults smoked in practically every kind of establishment, from business offices to hospital rooms to libraries. It wasn’t until 1964 when the Surgeon General first issued warnings that smoking was linked to cancer. 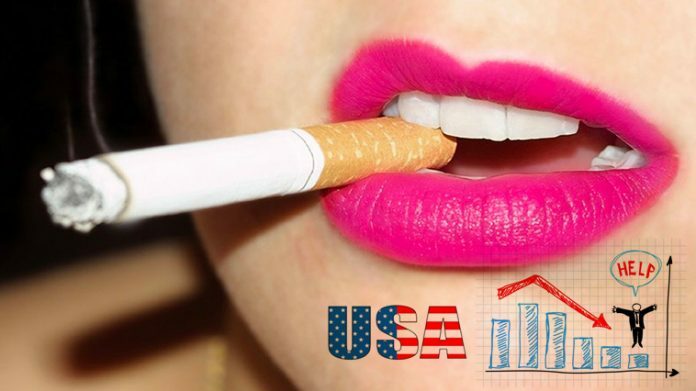 Over the past few decades, a steady diet of anti-smoking campaigns, additional taxes, and bans have played a major role in causing a U.S. smoking rate decline. The advent of e-cigarettes also has played a role in the change in society. About three percent of adults and 13 percent of teens vaped regularly in 2016, according to AP. Keep up-to-date with the latest news, research, legislation, and advocacy efforts by checking out our News page!